d. Website: the website www.easymoza.com. 2.1 These General Terms and Conditions shall apply to any Agreements between EasyMoza and Customer, to which EasyMoza has declared these General Terms and Conditions applicable. 2.2 These General Terms and Conditions shall also apply to any Agreements entered into with EasyMoza, for the execution of which third parties must be engaged. 2.3 Any deviations from these General Terms and Conditions shall apply only if they have been expressly agreed in writing or by electronic means. 2.4 In case one or more provisions of these General Terms and Conditions should be void or should be cancelled, the remaining provisions of these General Terms and Conditions shall remain in full force and effect. In that case EasyMoza and Customer shall confer in order to agree new provisions to replace the void or invalid provisions, taking into account the purpose and effect of the original provisions to the extent as possible. 3.1 All offers shall be free of engagement unless specified otherwise. 3.2 Illustrations, prices and other information provided by EasyMoza are subject to change and shall not be binding upon EasyMoza. 3.3 EasyMoza's offer shall not be binding upon EasyMoza in case of misprints, typographical or programming errors in its catalogues, mailings or the website. 3.4 The price quoted for the payment code is inclusive of "BTW" (Dutch VAT). 4.1 The Agreement shall be entered into upon acceptance of the offer by Customer and once the conditions made in the offer have been met. 4.2 In case Customer has accepted the offer by electronic means, EasyMoza shall immediately confirm the receipt of the acceptance of the offer, using electronic means. As long as the receipt of this acceptance has not been confirmed, Customer may rescind the Agreement. 5.1 After Customer has uploaded the main photo and all tile photos through the website, the photo mosaic is produced. Customer may zoom in and out of the photo mosaic. If Customer is satisfied about the photo mosaic, Customer may order a payment code through the website. Using this payment code Customer can order EasyMoza to convert the photo mosaic into a large-size jpeg file. Once the photo mosaic has been converted, the Save button appears, and Customer may save the photo mosaic on his computer. 5.2 The dimensions of the jpeg file depend on the uploaded main photo. 5.3 The size of the jpeg file depends on the number of colours of the main photo. 5.4 Customer's computer needs to have RAM memory of at least 2 GB. 5.5 Customer may print the photo mosaic or have it printed. EasyMoza only supplies the jpeg file. 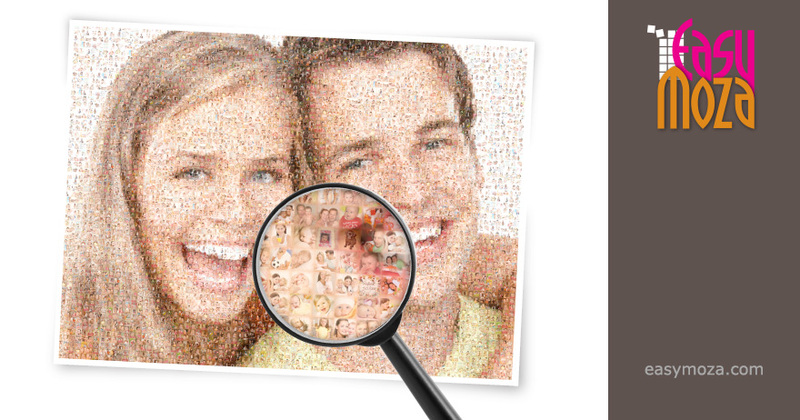 EasyMoza shall in no way be liable for the quality of the printed photo mosaic. 5.6 EasyMoza shall back up the photo mosaic online free of charge for one month. After one month the photo mosaic will be deleted from the server. b. which contain an image in violation of the law. 6.2 In case of non-observance of this article on the part of Customer, EasyMoza cannot be made liable for any damage caused to Customer as a result of that. Customer himself is responsible for the use of the photos. 7.1.1 The payment code purchased by Customer through the web shop shall be valid for 3 months. 7.1.2 After payment of the payment code the code will be shown on the screen, and also sent to Customer by email. 7.1.3 The payment code may be used once by Customer in order to have the photo mosaic converted into a high resolution jpeg file. Customer can then download the file from the EasyMoza website. 7.1.4 The payment code cannot be exchanged for money. 7.1.1 A video template purchased by Customer through the web shop will be delivered as an MP4 filetype. 7.1.2 After payment of a video template the video will be created within 24 hours. When the video template is created an email will be sent to Customer with a download-link of the video template. 9.2 In case of a justified complaint, for instance because the payment code cannot be used as a result of a system malfunction, EasyMoza shall repay the amount paid by Customer. Also when Customer is unsatisfied with the output of a high resolution mosaic jpg or a mosaic template that has been bought by Customer EasyMoza shall repay the amount paid by Customer. 9.3 Any claims against EasyMoza which have not been submitted to EasyMoza within 3 months after they first occurred, shall be cancelled by lapse of time. 10.1 EasyMoza shall not be liable for any damage caused by the non-availability of the possibility to order, non-accessibility or removal of its website due to maintenance or otherwise, whether they occur temporary or otherwise. 10.2 EasyMoza shall not be liable for damage of whatever kind resulting from or due to irregularities in the photos uploaded by Customer through the website. 10.3 EasyMoza shall not be liable for damage of whatever kind caused by EasyMoza acting upon any incorrect and/or incomplete information provided by Customer. 10.4 Flash requires considerable memory capacity of a computer. EasyMoza shall not be liable for Customer's computer stalling as a result of the use of flash. 10.5 EasyMoza shall never be liable for any indirect damage including consequential damage, loss of profit, loss of savings and damage caused by interruption of business operations. 10.6 In case EasyMoza would be liable for any damage, EasyMoza's liability shall be limited to the amount paid by Customer for the payment code. 10.7 The limitations of liability as contained in these General Terms and Conditions shall not apply in case the damage is caused by intent or gross negligence on the part of EasyMoza or its subordinates. In case of Force Majeure EasyMoza shall not be obliged to compensate any damage caused to customer as a result of that, except and to the extent that - due to the circumstance of Force Majeure - EasyMoza has obtained an advantage, which would not have been obtained by EasyMoza in case of correct fulfilment. 12.1 Customer is prohibited from copying, forwarding, distributing, reproducing or publishing any information, texts, logos, brands, trade names and such obtained through the website, without the prior approval given by EasyMoza in writing or electronic form. 12.2 Customer shall possess all necessary approvals required for the execution of the Agreement. 12.3 By giving an order to publish or reproduce objects provided by or on behalf of Customer but protected by the "Auteurswet" (Dutch Copyright Act) or any other legal regulations with respect to intellectual property rights, Customer declares that such is not a violation of legal provisions and an infringement on protected rights of third parties, and Customer indemnifies EasyMoza against any claims of third parties or with respect to any direct and indirect consequences, both financial and otherwise, resulting from publication or reproduction. EasyMoza shall take appropriate security measures in order to protect the website against the risks of unauthorized access to or modification, destruction or loss of the data entered by Customer through the website, but EasyMoza cannot give any guarantees with respect to this. 14.1 The applicable version of these General Terms and Conditions shall always be the version as valid at the time at which the Agreement was entered into, unless Customer has accepted the applicability of a reviewed version of these General Terms and Conditions after the Agreement was entered into. 14.2 parties shall not submit matters to a court of law until after they have made every effort to settle a dispute by mutual consultation. 14.3 Any Agreements entered into between EasyMoza and Customer shall be governed by Dutch law. 14.4 Any disputes in connection with Agreements between Customer and EasyMoza shall be adjudicated by the Dutch court having jurisdiction in the registered place of business of EasyMoza. Customers being consumers may, during one month after EasyMoza has informed Customer in writing that EasyMoza has invoked this provision, choose that the dispute is adjudicated by the court of law having jurisdiction by operation of the law.